February is here... well, not quite... but we're ready for it! in, seriously, a fraction of the time! It's so much fun to watch our Babylock Spirit race right through. January's design was a blockbuster! 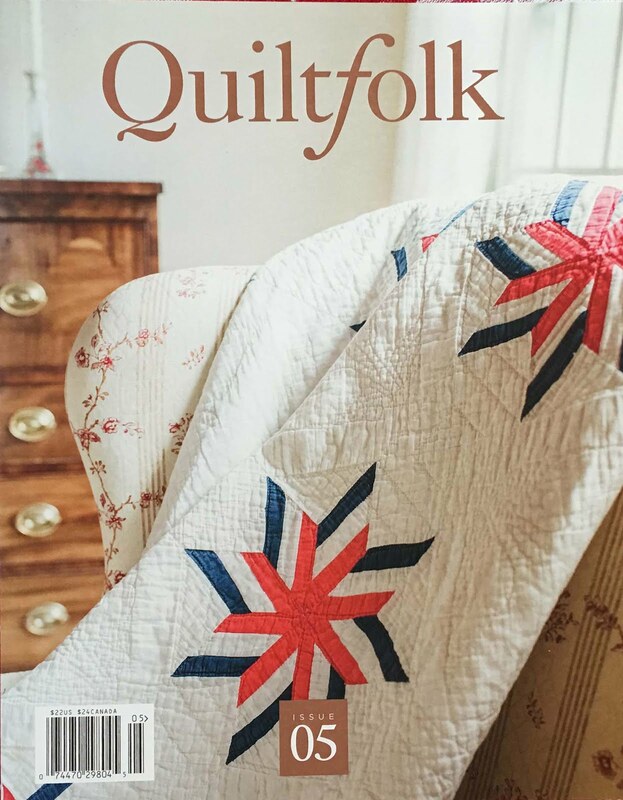 You split evenly between those who were hoping the quilting was part of the design (it isn't), and those who were hoping it was NOT! Quilt over gorgeous cross stitch? The answer is-- YES! 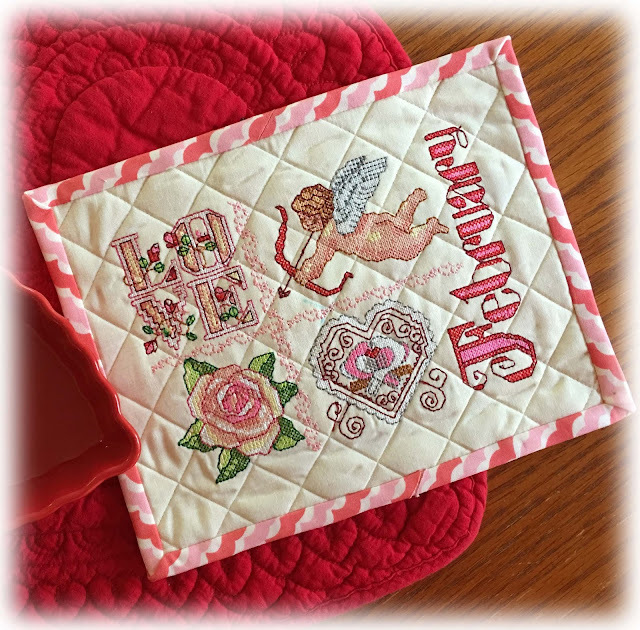 And we quilted over it again this month... because they stitch so quickly, you can just make another one! We'd love to start a project gallery for just cross stitch-- so if you come up with something fantastic, show it and tell it on our Facebook Project Photo Group. You have to request membership, but only because we're trying to prevent spammers. It's a great place to see what everyone is doing... we love it! For those of you who are working on "My Christmas Album,"
we're steaming ahead with two more blocks and hope to release them this week... then there's only two more to go! We have a FANTASTIC finishing idea kit for that as well. Total embroidery gorgeousness. If you "FOLLOW" this blog by entering your email, above right, and you'll be the first to get a sneak peek of that, and trimming instructions will be up soon as well. And last but not least, CLOUD CLUB! Many of you can't wait to finish-- we stitched out this first test and it's great! We're still debating if we want to add subtle color behind some of those feathers. What do you think? A Year of Cross Stitch--New Series! Once again, a Happy New Year to all! 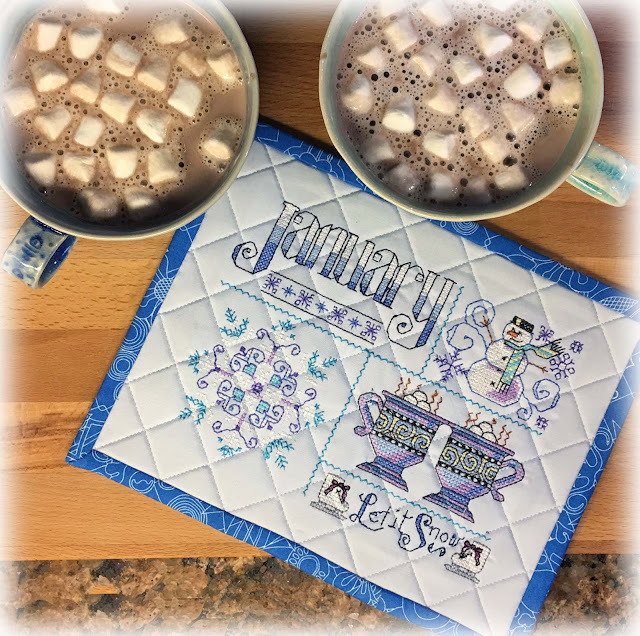 Ours has started with a bang-- the January Cross Stitch mug rug has really sold well, and so we think there are many people with fond memories of this glorious pastime! The idea to start digitizing cross stitch came last month. 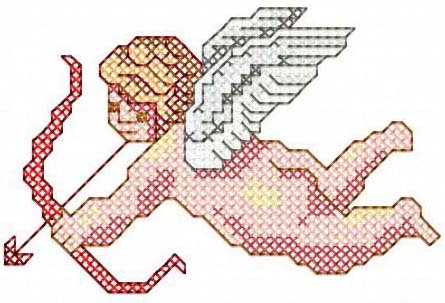 For a little relaxation, I have this OLD box of cross stitch patterns that I pull out every once in a LONG while. Back in the day, as I was just starting my career as an artist, I had a two-hour commute from the hinterlands of NJ to New York City for my job. Not one to sit still, I picked up this hobby from my neighbor and filled those hours with sewing, glorious sewing. When I think about it, I wasn't happy at that job in the city; but I LOVED my commuting time-- the roots of starting my own embroidery business were really sewn in those hours that many would have considered a waste. So never think that the simple things you do in life are unimportant. When you think of the hours it took to get this far, I still think I am more than halfway. Instead of watching towns roll by on a train, I now watch Hallmark Christmas movies. I'm sure some of you will remember these kits, mostly from the 80s and 90s. This one is a Christmas house, and featured "hardanger" where you cut holes in linen. Looks like I gave up on the border, and there is a bottom underlay with the tree I never even started. Isn't it gorgeous, though! 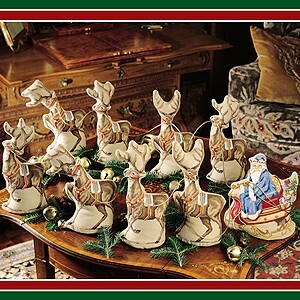 Talk about the time required... in this kit, you were supposed to stitch eight tiny reindeer and then Santa on his sleigh for a 3D display. Even commuting 4 hours a day-- I only ever finished one reindeer and then decided to make a framed piece of that instead. I googled it, and it is a Leisure Arts kit, that is still available on line-- if you have four empty hours a day and are interested! These were snowmen, that were supposed to fit in a tray. I wisely decided NOT to buy the tray until it was finished! Many of these kits are still available on eBay, unopened. And so I congratulate myself on getting this far. As an artist, I very quickly ventured into drawing and stitching my own patterns. This is one I drew from a cameo passed down from my grandmother. I entered contest it in a cross stitch magazine, and won a prize. Think of that... my first published pattern! I tried to find the magazine online, and old copies are available, but I'm not really sure which issue it was in. As you get down to the bottom of the box, the pieces become less and less finished. It would take a lot of ambition to start this "Fruits of the Spirit" again. When I am feeling nostalgic, I think of the time when that needle was last sunk into that cloth, and I think of the person that I was then, and what I am now. Yes, I'm sappy like that. Later on, as I'm sure cross stitch decreased in popularity, designers put out easier kits... these even came with a mat and frame. But you can see, though close, they are not even finished-- there is simply no time for us modern women anymore! So during "Christmas at Pemberley" on the Hallmark Channel, as I am still not good at sitting still, I started once again sketching my own cross stitch. I tried it years ago, but it seemed difficult. It actual seemed, well, SIMPLE and FUN-- and best of all FAST to do and stitch out, and it looks incredibly like the real thing that takes years to do! Sew easy, in fact, that I was willing to risk spilling hot chocolate on it! We're now on a mission to resurrect this glorious craft-- join us! It's an heirloom in an hour. We'll be going through the months, and even adding some special editions, like birthdays, Mother's Day, puppies and kitties, as we go along. The goal is to also issue each of the little parts, like the snowflake and skates, individually, for those who want to make something else of their own inspiration. 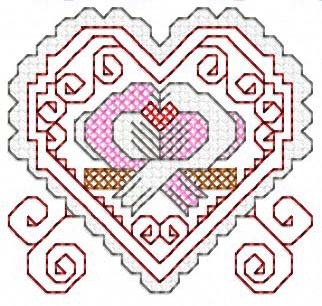 Thank you so much for your response-- it is really gratifying to know that YOU all have memories of doing cross stitch, and we'd love to hear your own stories below. Maybe you'll even pull out some of your own old kits! Welcome to the Year of Cross Stitch! Subscribe to our mailing list to be notified of new sets, sales, and free stitch-alongs. Join our Private Mailing List! View our Embroidery Thread Kits! "The Brave New World of Computerized Quilting"